Existing scientific research works regarding external debt had been ana-lyzed. 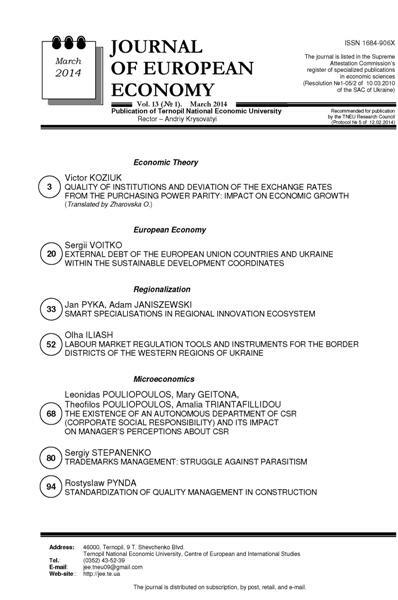 Analysis of the positions of Ukraine and European Union countries on the coordinates of the Quality of life index, Safety of life index, and Sustainable de-velopment index grids has been conducted based on the 2012 data with consid-eration of the external debt of the respected countries. It has been proved that the European Union countries with substantial amount of external debt present somewhat better results in Quality of life index than they do in Safety of life index. A high level of Quality of life index has been noted among the majority of the EU countries along with significant amount of the external debt per citizen. The presence of the the «gravity» effect has been proved for the neighboring countries, which has been reflected by similar values of the complex indicators, quality of life and safety indexes. High value of the correlation coefficient between the Economic dimension index and Sustainable development index has been revealed; this also proved external loans as influence on better performance of the values of both of the indexes. European Union, external debt, Quality of life index, Safety of life index, Economic dimension index, Sustainable development index. It is stressed, that the global monetary relations are distorting the global competitiveness. Economic growth maintaining under the middle and low income countries competitive pressure is possible with the deviating down of the nominal exchange rate from PPP or with high graded institutions developing that can encourage innovations, business opportunities, and capital inflows. Basing on the data of 82 countries it is empirically confirmed direct and statistically meaningful relations between quality of institutions and exchange rate deviations from PPP. It is found that five clusters of the countries joined by the principle of quality of institutions and exchange rate deviations from PPP. The highest economic growth is observed in the countries with strong institutions and little undervalued exchange rates. The countries with low graded institutions may maintain economic growth only under the strong undervaluation of currency. Developed countries may deal with the competitive pressure due to the institutions of high quality. Quality of institutions and institutional competition are expected to be the most important forms of the global economy fragmentation. Quality of institutions, purchasing power parity, exchange rate, global competitiveness, real convergence, global monetary relations. In times of economic crisis creating new kinds of advantages remains a key task which determines a quick recovery from economic difficulties as well as whether the fast socio – economic development of the country is achieved. These advantages should be based on the use of knowledge, intellectual capital and abilities of the state and local self governments’ structures to support and establish conditions for the innovative development of the country and its regions. RIS is a public policy instrument whose guidelines are directed at a priority of the innovative development. The paper presents both the methodical foundation for building the regional innovation strategy and vision for the development of an innovation ecosystem in Region. National innovation system, regional innovation strategy, innovation eco-system. 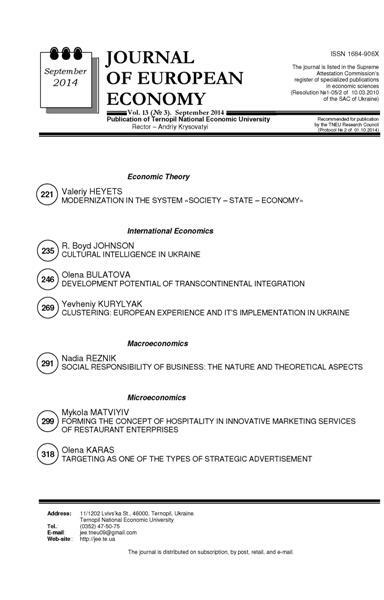 In this paper the characteristics of international trade of the Black Sea Re-gion economies and the European Union are examined. By using the relevant trade indices we examine the extroversion, the openness and the competitive advantage of the countries of the region in the international trade. Extroversion and export performance has deteriorated for the majority of the countries of the region. The examination of relevant trade indices (as the Balassa Index), show that the majority of the exporting products of the Black Sea Region refer to the low, and medium-low technology category, where they have the comparative ad-vantage compared to the European Union. The need for a policy that would ac-tively encourage the development of further trade and economic relationships between EU and the other countries of the region is highlighted. International Trade, Balassa Index, Black Sea region. This study examines whether a separate – autonomous or not – CSR de-partment within the company, affects the opinions of managers of Greek enter-prises about practices and activities of CSR. The findings suggest that managers of companies operating in Greece, without a special CSR department, accept a greater degree of institutionalization of CSR, since it offers financial and tax advantages in contrast to the companies with a specialized department. In other, we found that the way a company manages its activities and practices of CSR is not largely affect the perceptions of managers or directors, in connection to whether a company has a separate CSR department, or not. Corporate Social Responsibility (CSR), Social Responsibility, CSR institu-tionalization, internal- Autonomous CSR department, society, environment, em-ployees. Essence and forms of ambush marketing as display of unethical competi-tion and its effects on the authentic firm have been determined in the article. The author of the article has also defined directions of multipronged resistance to parasitism and has revealed its contents. Administrative-judicial and legal protec-tion of trademark rights, which were outraged, have been proven in the article. Intellectual property, trade designations, commercial symbols, trademark, brand, unethical competition, ambush marketing, administrative and legal protec-tion of intellectual property rights, Antimonopoly Committee of Ukraine, judicial protection of intellectual property rights. Quality standardization is especially important for companies that provide construction, installation and repair services. The subjects of the construction in-dustry that ensure a high level of quality management systems and are capable of promptly passing the construction site with the best cost performance of construction works and services are characterized by competitive advantages. 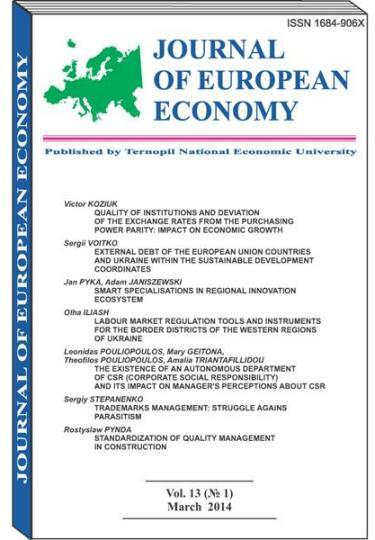 This article requires special attention to standardization of the quality of work and services in the sphere of the construction and development of regional building clusters. Standardization of construction works quality, quality management, re-gional building (construction) clusters. All common and contradictory in society, state and economy on the way to modernization transformation is analyzed; concerning all mentioned above, the role of personal-human factor in its transformation is defined. The influence of globalization on county development in cooperation with world and national is revealed. The role of state in unity of society and personality, its capacity to organize and implement the process of recourses usage and knowledge accumulation in combination of moral and mind, what can’t be avoid without effective state and public control over processes of modernization is grounded. The public mood towards some constituents of social system of Ukraine is analyzed. Modernization transformation, national states, postmodern model, public conciseness, knowledge, mind, moral, human capital, social state, degree of state presence, state and public control. 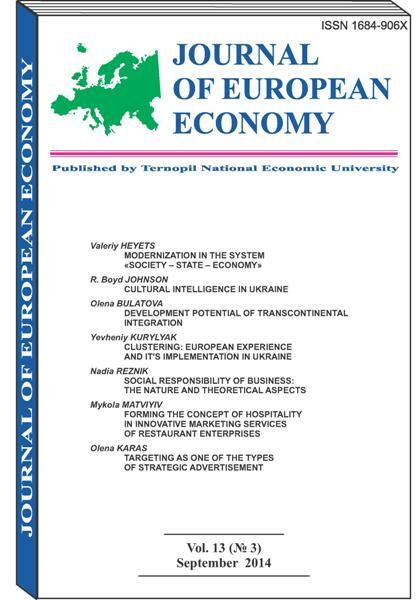 The article analyzes the existing theoretical and empirical approaches to the concept of economic freedom and its importance in the evolution of the country. The results of the identification of dependencies between indicators of economic freedom of the countries and individual indicators of their economic development were discovered. It was found the typical direct links between the expansion of economic freedom and the welfare of the population for the majority of the countries. Economic freedom, economic development, economic growth. In this article there have been examined the economic problems of the Russian investment construction sector. The economical growth directions of economic activity «Construction» have been determined. Comparative analysis of key economical institutional indicators has been performed. Research and practice problematic of the development of Russian ICC – high transaction costs of investment construction cycle – has been actualized. Entrepreneurship, construction, transaction costs, entrepreneurial costs, regulation costs, development indicators, investment construction cycle, contracting. 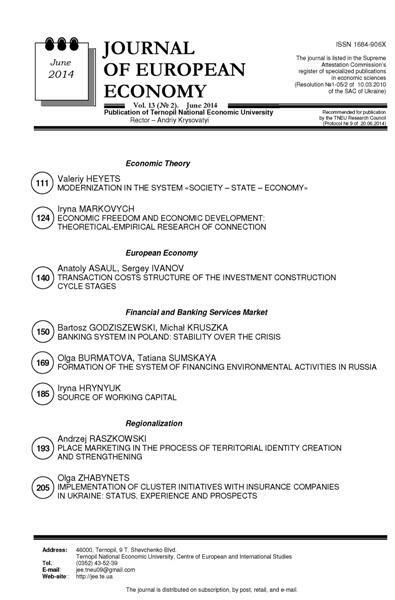 The paper introduces performance of banking system in Poland during the period of European economic crisis. It also contains presentation of influence of financial supervisor on financial market and the real sector of the economy and possible threats to the institutional framework of financial supervision in Poland. Article presents how microeconomic changes of parameters of mortgage granted in foreign currency can be transformed into bank’s capital needs. Some details about resolutions and recommendations issued by the Polish Financial Supervision Authority (KNF) are also magnified in the paper. The practice of last years indicates that activity of the supervisory authority is an important determinant of financial stability. Financial supervision, Poland, FX lending, macroprudential regulations. The paper is devoted to the problems of formation of the financial mecha-nism of environmental protection in the framework of local production systems. The authors identified main sources of costs for environmental purposes and an-alyzed the trend of reducing the fiscal costs of environmental protection. Particular emphasis is placed on the legal aspects of the use of payments for negative impact on the environment, including the abandonment of the use of funds to the budget as the price of a negative impact on the environment. The importance of environmental funds in the financing of environmental activities is shown, the importance of programmer – oriented approach to solving environmental problems is marked. The possible elements of the financial mechanism for the implementation of environmental protection measures are proposed. The main difficulties including stimulating effect in the economic mechanism of nature conservation and environmental protection are marked. Financial mechanism of environmental protection, environmental measures, payments for negative impact on the environment, fiscal policy, the budget allocated for environmental protection, promotion of environmental activities. The article deals with the analysis of the main sources of raising additional funds, the risks and liabilities associated with them to meet the requirements of current legislation of Ukraine. There has been made the conclusion about the expediency of different funding sources. The paper discusses the problems referring to place marketing related to the process of territorial identity creation and strengthening. Territorial identity strengthened by the activities carried out within the framework of place marketing constitutes the crucial component of the development process occurring in the contemporary territorial units due to emotional relations of a given community with the place of its existence. The core of the study is focused on the presentation of selected elements constituting place marketing areas which can have a favourable impact on re-gional identity strengthening. Each of the areas has been supplemented by the list of potential advantages in this particular context. The following factors were listed: brand and image of the place, an effective promotion process, entrepre-neurship enhancement, the organization of events, regional (local) products, Corporate Identity for territorial units, international cooperation, the creativity of self-government authorities or flexible management systems. Territorial identity, place marketing, territorial unit, socio-economic devel-opment, factors of competitiveness. 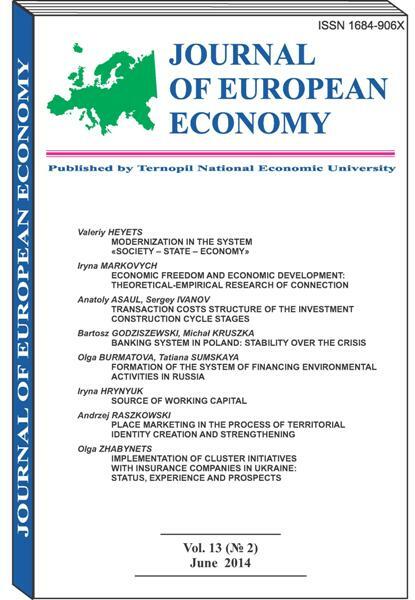 The article analyzes the prospective directions of realization in Ukraine cluster initiatives involving insurance companies in the article. It commits retrospective analysis of the establishment and functioning of clusters in Soviet Ukraine, Ukraine and abroad (EU and USA). Outlines the prospects and create conditions in our country insurance and financial clusters. Clusters, cluster initiatives, insurance companies, insurance clusters, in-surance financial clusters. The process of globalization provokes the continuous rise of cultural intel-ligence (CQ). Article is based on the findings of the CQS research conducted in Ukraine (2012–2013). The research was conducted in three phases. Phase I in-cluded the translation and adaptation of the scale to the audience with the use of two focus groups that consisted of 17 respondents. Phase II was about the test-ing of cultural intelligence scale for larger audiences in Ukraine using the trans-lated scale from Phase I for 300 students. Phase III – The implementation of the Cultural Intelligence Scale (CQS) to approximately 1800 individuals throughout the country. Instrument was translated into Ukrainian and Russian; validity testing was conducted during pilot phase, country-wide CQ of Ukrainians was meas-ured. The research findings made a considerable contribution to the understand-ing of cultural intelligence in non-American settings. Cross-cultural communication, cultural intelligence (CQ), cross-cultural in-teraction, Cultural Intelligence Scale (CQS), transferability.